Confidence and a positive self esteem in a child goes a long way to shaping a successful and happy future. It gives them the courage to try new things, stand up for themselves and accept love and praise. It helps them make good decisions, set goals and look forward to the future. In Madeleine, Maddy and Midge Cathy Domoney provides an environment that helps children feel good about themselves. Appealing to all ages as a read alone book or one that is shared with an adult, Madeleine, Maddy and Midge is illustrated by Karen Davis who has created characters that compliment the positive and negative aspects of the book. Madeleine has two secret friends, Maddy and Midge. Maddy’s happy messages makes Madeleine feel tall, strong and full of confidence. Midge however, fills Madeleine with worries, troubles and doubt and makes her feel small, scared and alone. Madeleine has found the magic spell so that Maddy’s voice will be all she will hear and Midge will disappear like the ‘Pop’ of a bubble. Madeleine has a power to decide whether to be happy or sad. The question is, what will she decide? The use of empowering, positive descriptive words in Madeleine, Maddy and Midge gives children the tools they need to not only explain how they are feeling, but tools that will strengthen their thought processes, helping beat the confusion that is often found in a young mind. I loved the warm, loving relationship between Madeleine and her mother but did wonder if, to a child who is already feeling negative, this relationship would destroy them a little more if not found within their own family. Here leads further opportunity for teachers and therapists to open the door to discussion about families and the individual dynamics they hold. Cathy Domoney has done a wonderful job of addressing the reality of the fact that it is not easy to push those negative thoughts and feelings aside. Madeleine, Maddy and Midge is more than just a story book, it is a world full of information,empowerment and self awareness. Cleverly created to meet not only the needs of children but those of parents, teachers and therapist, Madeleine, Maddy and Midge is a resource worthy of sitting on all bookshelves. Using her experiences and qualifications of not only a primary teacher but that of counsellor and psychotherapist Cathy Domoney has included pages that provide pointers for using this book as a successful resource tool. She has included points to share with children along with suggested activities. 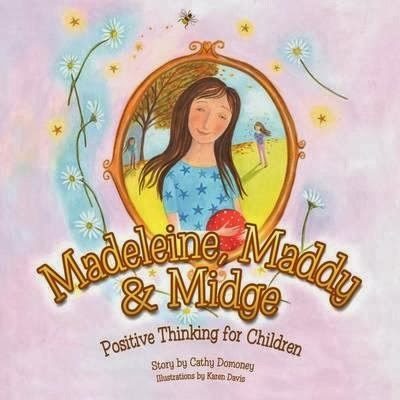 Madeleine, Maddy and Midge Positive Thinking for Children by Cathy Domoney is the ideal gift for any child, and a gift for any adult working in the eduction industry. This book has the ability to change a child’s life experiences without them even realising it.